Description: Robin-sized and short-billed, this is the largest of the unbanded (those without breast bands) plovers. It has an upright posture. The striking black and white of birds in breeding plumage is unmistakable. In flight, the undertail is white and contrasts with the black belly. From above, the white wing stripe and white tail with black barring is noticeable. Similar Species: American Golden-Plovers in nonbreeding plumage offer the most challenge. 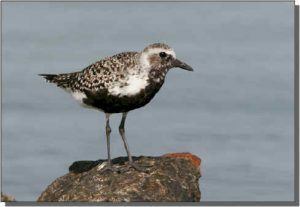 Black-bellied Plovers are noticeably larger than American Golden-Plovers. Look for a pure white undertail and black axillaries (wing pits) on Blackbellied Plovers in flight. Mountain Plovers are an overall gray-brown without any speckling. 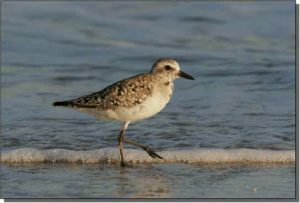 Comments: Black-bellied Plovers are seen throughout the Great Plains during migration, although rarely while in full breeding plumage. They breed on the arctic tundra and winter on sandy beaches and wetlands in coastal areas from central North America through southern South America. During migration through the Great Plains, they use drier short grass fields as well as flooded fields and wetlands. The “run-stop-run again” pace and “look-and-lunge” foraging behavior is characteristic of plovers.